Dressed casually, Catherine Begaye is going house-to-house knocking on doors to let people know that she's running to become the next state representative for District 23. By Election Day on Nov. 4, she plans to reach about 4,500 people in the district that covers parts of Albuquerque, Corrales and Rio Rancho. Her private Albuquerque law firm specializes in child advocacy law. She also sets aside part of her day to take care of her mother, who's living with her while she recovers from a recent accident. Begaye, a Democrat, won the primary election on June 3. Her opponent is the incumbent, Republican Paul Pacheco. "My feet hurt," she says as she rounds another block on the west side of Albuquerque. On this night, she aims to talk to 29 potential voters and let them know she will fight to increase the minimum wage, get more resources for families, strengthen the education system and other issues. "I want people to know I'm willing to listen," she said, as she carried a brochure that features her dressed in a turquoise jacket and matching jewelry with the caption, "She'll be on your side." Begaye said she's lived on Albuquerque's west side for the past 20 years. If she wins in November, she will represent a mostly white and Hispanic middle class population. Native Americans make up about 3 percent of the district. At Tony LaCour's home, Begaye and LaCour quickly find common ground on education, child welfare and fire safety issues. LaCour tells her that firefighters need her help to protect their pensions. Begaye promised that, if elected, she would be there for them. "I want to count on your vote," Begaye said. "You have it!" he said. 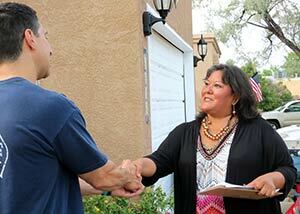 Begaye knocks on Verma Clark's door. Begaye learns that Clark, who is a mother of an elementary school child, has Navajo heritage. Clark describes a need for cultural content in public education so that Native children can learn about their culture. "There should be a wide variety!" Clark exclaimed. Since receiving her law degree about 10 years ago from the University of New Mexico, Begaye said she has advocated for hundreds of children. Referring to recent abuse cases that have resulted in children dying, Begaye said that these tragedies could have been averted if more funds were put into family welfare services. "Caseworkers end up having so many kids on their caseloads, they can't adequately (handle) them," she said. "Parents are relying on services, whether it's counseling, housing, or some sort of treatment, but if they can't even meet with their caseworker, they are even more behind the game. We have to fight to help get them the services they need." She expressed concern about a proposed state plan to increase work requirements to qualify for food stamps. "That would be great if there were jobs available," she said. "If we could raise the minimum wage, when people are working for more money, they will have less need of social services." Begaye is Honágháahnii (One Who Walks Around Clan), born for Tód’ch'’i'nii (Bitter Water Clan). Her maternal grandfather is Táchii'nii (Red Running Into the Water Clan) and her paternal grandfather is Kinlich’i'nii, (Red House Clan). Other issues she is concerned about include the Indian Child Welfare Act, Navajo language interpreters at courts and hospitals, support for Native American teacher aides who want to become teachers and the brutal killings of two homeless Navajo men, Allison Gorman from Shiprock and Kee Thompson from Church Rock. Laurie Weahkee, director of the Native American Voters Alliance, said, "We are really excited about Begaye. She would bring a wealth of knowledge to (the state legislature). "She's been supportive of issues related to minimum wage increase, which isn't just an Indian issue, but impacts Indian people significantly," she noted. As a Native legislator, Weahkee said that Begaye's knowledge of Indian law, like the ICWA, will make a difference in the lives of Native American children. Begaye's opponent, Pacheco, is a former police officer. Votesmart, a web-based legislative information service, notes that during the 2014 legislative session Pacheco voted in favor of concealed-carry guns, cutting corporate income tax rates and animal protection and against increasing the minimum wage. The Right to Life Committee of New Mexico and the National Rifle Association endorsed him. Pacheco didn't respond to a call from the Navajo Times by deadline. According to the Native American Voters Alliance website, Begaye is one of seven Native Americans running for government seats -- Debra Haaland for lieutenant governor, Doreen Wanda Johnson for House District 5, Harrison Todacheene for House District 4, Georgine Louis for House District 26, Rep. Roger Madalena for House District 65 and Lynda Lovejoy for Public Regulatory Commission, District 4.